Originated from a small Malay village in Negeri Sembilan, Chef Ismail was introduced to cooking by his grandmother, an avid food lover and cook. Chef Ismail discovered his passion in trying out the herbs and spices and fresh produce from orchards which were growing in abundance around him. Looking back, Chef Ismail recollects that helping his grandmother in kitchen has certainly helped to pave his career way in kitchen. Creating scrumptious dishes that whet one’s appetite is Chef Ismail’s enthusiasm and passion. He treasures the traditional culinary recipes and has decided to leave his hometown to polish up his interest. After pursuing Hotel Management and Catering qualification from Mara University of Technology, specializing in Chef Training, Chef ismail further expanded his skills with the Hilton International Kitchen Apprenticeship Programme for three years. Thereafter, Chef Ismail worked in the food industry and became a lecturer at Taylor’s College in Food technology and Kitchen Management for two years. Chef Ismail was also the Chef in the industrial kitchen at KFC Holdings for seven years before becoming Executive Chef at Restoran Yasmin for a year. He then began his stint as a host for various programmes for local television. He derived much satisfaction and excitement from hosting programmes such as Aroma, Sri Murni and Kuih Raya on RTM1; Hey Good Cooking, Wok and Roll and Makan Tap Diet on RTM 2; Riang Ria Bersama Cornflakes and Jom masak Bersama Sri Murni on TV3 and Ala-Ala Kampung on Channel 4 Astro. Apart from that, he was also explored to host Yok Buat Kuih Raya! On Suria Channel, TV12, MediaCorp in Singapore. Adding feather to his cap, Chef Ismail joined MATRADE on its tour to the United States of America, the Middle east and Europe to promote Malaysian food ad products. His involvement with the Ministry of Agriculture lies in the promotion of Malaysian fruits and food in Amsterdam. Chef Ismail also cooked Asian food at the Lady Jessy in cannes, South of France for two years, as well as for theatre artists at the Watermill Art Centre in South Hampton, New York for two years. With Tourism Malaysia, Chef Ismail also used to travel to Japan, South Africa, Cambodia and United Kingdom conducting cooking demonstrations to promote Malaysian cuisine. Apart of his expertise in cooking, Chef Ismail is also well versed in food styling, recipe creation and was appointed as consultant to numerous new restaurants in town. Because of his expertise and understanding of food industry, Chef Ismail was also the spokesperson for a few food manufacturing companies. After his vast culinary experience and exposure over the years, finally his own reataurant - Restoran Rebung Chef Ismail was initiated. The food served in his restaurant is a tribute to the wonderful traditional recipes inherited from the forefathers. Chef Ismail vouches for the food and traditional origins, and the comforting taste of kampong fare from past memories. Honing his skill from his past experience, complemented by hef Ismail’s creativity in creating new cuisines, frequenters can definitely expect the wonderful, exotic traditional dishes. Chef Ismail also ventured into recipe book production to document and to share his culinary experience in traditional Malay cuisine, ensuring that the invaluable national treasure will not diminish or forgotten over time. 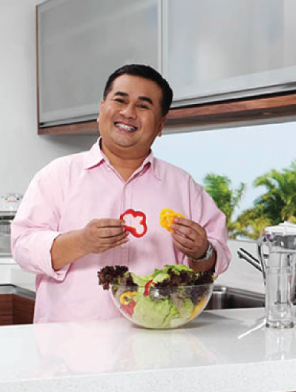 On top of that, Chef Ismail is also the brand ambassador of Pensonic since 2005, promoting intelligent household kitchen appliances that can help to make cooking a pleasurable experience.